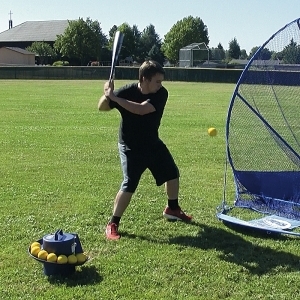 Jugs Soft Toss Pitching Machine offers quality repetitions to yield better hitting! Lightweight and portable - weighs just 13 lbs.-This light weight makes it convenient to move or carry. 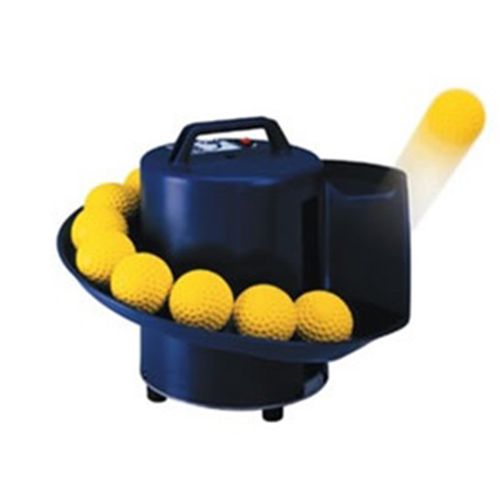 Holds 14 baseballs or 10 softballs - Multiple functions is an asset. In fact young baseball players may want to hit softballs first. No electricity needed for up to 8 hours of continuous use -This is a great function giving the user ample hours for use. Comes with an internal rechargeable battery (charger included) -As long as everything is kept clean and maintained, lasts for years! Great for offensive and defensive drills-Surprisingly you can do numerous defensive drills and save dad's arm at the same time. 2-year guarantee-Jugs is incredibly liberal with their guarantee policy. And they stick by it! Good for all ages-Many weekend warrior softball players have bought and love using the Jugs Soft Toss Machine.